All ticket sales are final – there are no refunds, or retroactive discounts. Ticket exchanges for the same or another performance of the same event will be considered by Wildey management based on availability and basis for the request. Every patron, regardless of age, must have a ticket to enter the theater. Please see policy regarding age restriction below. A ticket is a one-time revocable license to attend an event. We wish to protect our patrons from unfair ticket price gouging. We reserve the right under this agreement to cancel any purchase made by someone in the business of purchasing tickets for the purpose of resale at a higher price. Ticket sales on the premises are through our box office only. All other sales are prohibited. If lost or stolen, we may be replace your tickets if you provided your name and other information when you made the purchase. A ticket presented and used for admission cannot be used again. Weapons, and outside food or beverages are not permitted in our theaters. Professional cameras and recording devices are only allowed in the theatre with advance approval of the artist and venue. 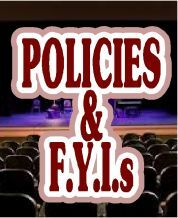 Each show may have different policies for use of cameras and cell phone for taking photos and videos. Please check with the venue for each show restrictions. Taking photos and/or videos can be dangerous for performers, annoying to other patrons and can violate copyrights. We reserve the right to confiscate any camera or recording devices used in the theater without prior approval. If a patron’s conduct endangers or disrupts the performers or other patrons, we reserve the right to remove that patron from the premises. No refund will be made. Some events limit the number of tickets that can be purchased by any one patron. Additional orders to that patron’s credit card or address will be denied or cancelled. Each individual show’s producer or artist determines the seating policy for late patrons. In some instances, if you arrive after the show begins, you may be asked to wait until there is a natural break in the performance before being seated. Artists, programs and dates are always subject to change. Children 6 and older that have a ticket are welcome to attend most performances at The Wildey Theatre. Based on the performance, children under the age of 6 may attend, but will require a ticket. Other age restrictions may apply at the request of individual act and producers, so please review the show information or call the Box Office prior to purchasing tickets as all performances may not be appropriate for all age levels whether that is based on content and/or length of performance. Please note that any person who disrupts a performance or inhibits the enjoyment of other guests may be asked to leave the theater without a refund.